The collapse of bee colonies around the world has received much publicity lately. 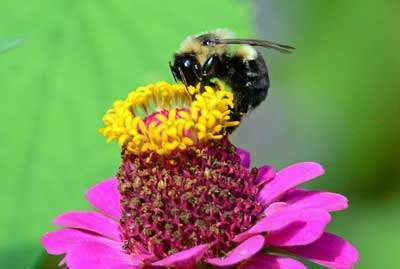 It is a trend with alarming implications given bees’ crucial role in pollinating many agricultural crops, and some researchers have attributed it, at least in part, to widespread use of a class of pesticides called neonicotinoids. These are chemically related to nicotine, and they are thought to challenge the health of bee colonies by impairing bees’ ability to learn and navigate as well as impairing their motor functioning. Recent research now suggests that bees may be preferentially drawn to foods laced with these pesticides as a result of reward mechanisms. It is a fascinating lesson in how knowledge gleaned from one area of science—in this case addiction science—can inform our understanding of a global ecological crisis. In a letter published in Nature in May, a team of British researchers reported that honeybees and bumblebees actually preferred sucrose solutions that contained common neonicotinoid pesticides over sucrose solutions without the pesticides. Taste preference was not the reason—the pesticides were found to have no effect on bees’ gustatory or sucrose-sensitive neurons, so they could not taste the presence of the pesticides and the pesticides had no impact on their ability to detect sugar. Thus the authors suggest the bees’ preference for foods containing these pesticides likely arises from the action of the pesticides at nicotinic acetylcholine receptors in the bees’ brains. Nicotinic acetylcholine receptors are found throughout the bee brain, including in areas called “mushroom bodies” essential for memory and learning. When administered chronically, neonicotinoid chemicals are known from previous research to impair olfactory learning and memory in some bees. In this study, bees preferred the neonicotinoid-laced nectar but ate less food overall; bees faced with a choice between untainted nectar and nectar with a high concentration of neonicotinoid chemicals still preferred the latter, even though a high proportion died. The authors of the study suggest that these chemicals not only affect the foraging bees collecting nectar but are also brought back to the hive to affect the entire colony. We are all too familiar with the disruptive effects of nicotine in human beings. Smokers may have terrible difficulty giving up cigarettes even though they consciously know that tar and other chemicals in tobacco smoke are harming their health and potentially shortening their lives. The Nature study suggests that preference for a health-damaging substance as a result of brain reward mechanisms may be a phenomenon with relevance to other important areas than human health. More research will be needed to establish this connection, of course. Although the USDA and other organizations have linked neonicotinoid pesticides to colony collapse, and some of these chemicals were temporarily banned in Europe pending further study, the extent of their role remains a matter of controversy. Also, the finding on bees’ preference for pesticide-laced foods will need replication and further examination. But it suggests a surprising way that addiction science might prove relevant to understanding animal behavior outside the laboratory, behavior that has major impact on our economy and food supply. And maybe the self-destructive behavior of the addiction-fueled bee crisis can also help us understand human behavior as well. We claim to be a compassionate nation. The very nature of our country's existence is dedicated in principles toward improving the human plight. Yet we are mostly ignoring a virtual holocaust in Latin America that is a direct consequence of OUR behavior. Money from illicit drug abuse in America finances and sponsors some of the most ruthless, heinous crimes the world has ever seen. Thus far, an estimated one hundred thousand or more Mexicans have been tortured and murdered. While our politicians crack jokes and make fun of their own past indulgences, while our media is hellbent on an agenda of national legalization of marijuana, while the pot lobby touts the newly discovered ‘medical’ wonders of its miracle herb, and while academia focuses obsessively on wrongs committed by European Americans centuries ago, at this very moment now in REAL TIME, unspeakable crimes against humanity (tortures and murders) occur on a daily basis just a stone's throw away from our southern border. Do we have no shame? Where is NIDA in all this? Is addiction in America primarily driving the illicit drug flow? Is our marijuana friendly popular culture encouraging the masses to indulge in a variety of illicit drugs that in turn finance this horror? Are drug-deranged minds actually committing these crimes? If self-destructive behavior from addiction can destroy whole bee colonies, can widespread drug abuse and addiction within our populace set our whole nation on a path toward self-destruction? "Where is NIDA in all this? Is addiction in America primarily driving the illicit drug flow? Is our marijuana friendly popular culture encouraging the masses to indulge in a variety of illicit drugs that in turn finance this horror? Are drug-deranged minds actually committing these crimes? " Please. Please. Step out of 1954, into actual science and modern society and out of any attempts at respectable evidence based medicine. Just leave. Please. NIDA. "Addiction Science Can Help Us Understand the Bee Crisis." National Institute on Drug Abuse, 1 Sep. 2015, https://www.drugabuse.gov/about-nida/noras-blog/2015/09/addiction-science-can-help-us-understand-bee-crisis. NIDA. Addiction Science Can Help Us Understand the Bee Crisis. National Institute on Drug Abuse website. https://www.drugabuse.gov/about-nida/noras-blog/2015/09/addiction-science-can-help-us-understand-bee-crisis. September 1, 2015.